(Phys.org) —A study involving Victoria University researchers supports the longstanding theory that taking part in extreme, painful rituals increases prosocial behaviours and attitudes including making people more charitable. Religion expert Dr Joseph Bulbulia, Associate Professor in Psychology Dr Ron Fischer and Dr Paul Reddish are contributing to international research which seeks to understand why extreme religious rituals have persisted throughout human history and into modern times. 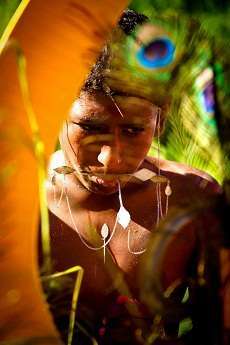 The trio visited the Indian Ocean island of Mauritius last year to observe two rituals that occur during the annual Hindu festival, Thaipusam. "We're interested in understanding why so many religious rituals contain an element of suffering, and why extreme rituals, such as those in Thaipusam, persist for centuries," says Dr Bulbulia. The team examined a 'low-ordeal' ritual involving singing and group prayers, and compared it to a 'high-ordeal' ritual known as Kavadi. The two rituals are similar in most respects, except in terms of their intensity. Kavadi ritual Kavadi involves body piercing with multiple needles and skewers, carrying heavy bamboo structures, dragging carts attached by hooks to the skin for over four hours, and climbing a mountain barefoot to reach a religious temple. With colleagues from Denmark and the Czech Republic, the three researchers carried out the first 'natural' experiment investigating the social effects of taking part in extreme rituals. They randomly selected participants and asked each a series of questions about social identity shortly after one of the two rituals had taken place. They also gave participants 200 rupees (equivalent to around two days' salary) for contributing to the study and gave them the opportunity to anonymously donate some or all of the money back to the temple. Using these identity and charity measures, the researchers were able to gauge levels of social connection in response to taking part, or observing, rituals which contained different levels of pain. Dr Bulbulia says people taking part in both rituals were very charitable. "However, in the painful, extreme ritual, levels of charity were significantly higher—in fact they were almost twice as high." They also found that levels of charity were not predicted by whether or not a person had taken part in the Kavadi ritual, but actually by how much pain a person associated with it. "The pain finding was interesting, but not entirely surprising," says Dr Bulbulia. "The results support longstanding theories that extreme rituals, involving painful or demanding individual displays of commitment, increase people's prosocial behaviours and attitudes. "However, before this study the theories had yet to be put to the test in a natural human setting." The results were recently published in the leading journal Psychological Science. Although the study was confined to the small island of Mauritius, Dr Bulbulia says the results have wider implications. For example, the results may help in understanding the solidarity-enhancing role of suffering in sporting contests or national memorials like Anzac Day. The researchers plan to continue their work in this area with a further visit to Mauritius scheduled for 2014. The study was supported through Victoria University Research Fund Grant. Dr Joseph Bulbulia is a Senior Lecturer in the Religious Studies Programme and Dr Ron Fischer is based in the School of Psychology and Centre for Applied Cross-Cultural Research at Victoria University of Wellington. Dr Paul Reddish completed his PhD at Victoria in 2012. He is currently a postdoctoral researcher at LEVYNA, the Laboratory for the Experimental Research of Religion, at Masaryk University in the Czech Republic. Worthless study: it only found that people willingly going through painful ordeals in the name of their religion are at the same time also more charitable towards that same religion. There is no hint at what is the cause and what the effect, or if there is any causality at all. Nor does it lead to any conclusions about suffering pain in general or charity in general. It's obvious that people more dedicated to their religion will both be more charitable towards their religion, and more willing to go through extreme ordeals. These two aspects are correlated, because both are correlated to religiousness. People who have more faith in the ritual are likely to participate or attribute greater pain to those who do...why couldn't the greater faith/belief in the ritual be the trigger for greater charitable contributions? Possessiveness is a natural human instinct. To willingly giving things away one must make a conscious mental effort. Enduring pain also depends on making a mental effort. Therefore, strong minds are the basis of both charity and resisting pain. The study should have tried to find out if people who can endure less pain are also less charitable? Maybe that's why the sequestration is being implemented to inflict maximum pain on the population, to increase charitable giving. Sheer genius! Perhaps it really is all about the children, after all. Forget that! I rather be greedy with no back pain! trolls are running unchecked here. I giving a lot of random 5s to lots of people to wreck this flawed rating system on PhysOrg until the admin get their acts together. Sign on folks, the competition with down-voters Open and Toot are such fun!